Youth - Trachtenkapelle Lech - mehr geht nicht! The Town Band is not only an important part of village community-life, but over the years has developed into being an essential representative of the village - whether it be the summer concerts, official occasions (such as the Europa Forum), the traditional winter concert or as musical ambassador to Lech`s partner resorts. To satisfy these extensive responsibilities it is vital for us, as with any other association, to regularly recruit younger generations. Playing music not only brings musicians together but is also a meaningful and fun use of leisure. When playing within a group the musician is required to HEAR, THINK, SEE and manipulate an instrument at the same time. Hardly any other activity occupies this many senses simultaneously. By actively participating within the community of the Lech Town Band, young people´s personalities are developed and shaped, as well as granting them a worthwhile and attractive way of spending their free time. 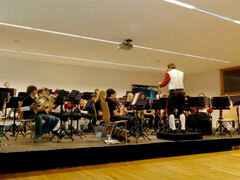 The town band is striving to capture young people´s interest in brass band music. These days modern brass band compositions offer such a variety which cater for all musical tastes and preferences, as well as providing a sound challenge to improve musical abilities. The prerequisite in becoming a member of the Lech Town Band is to learn a brass or percussion instrument at the Lech Music School. The music school also offers preparatory programmes, such as "early musical education" and recorder tuition as well as the Youth Brass Band of the music school as a preliminary band! Take advantage of this offer! 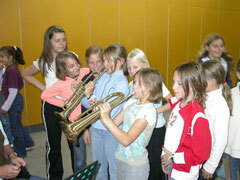 Students usually join the Lech Town Band after having obtained the "young musician´s bronze achievement award" or after having completed 3-4 years of music school and having attained the relevant musical progress. Fluegelhorn-, Trumpet-, Trombone-, Tuba-, French Horn-, Bariton Horn-, Flute-, Saxophone-, Clarinet-Players and also Percussionists. 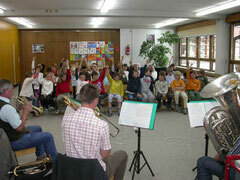 In general instruments are provided free of charge if the student wishes to become a member of the band (the music school should be informed during envolment). In addition, if one of the above mentioned instruments is selected, the Lech Town Band will meet 50% of the tuition fees for the last 6 semesters in the Lech music school! Constant feedback between music teachers, parents and the band guarantee that the interests of all concerned are fulfilled as best as possible. 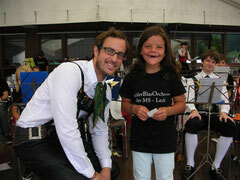 We warmly welcome anybody who is interested and would like to become a member of the Lech Town Band! For questions and more information please contact our Bandleader Mr. Marc Gusner, who would be very happy to help you.